Among the sound of clinking glasses and rumbling conversation, Dutch-bred actress Carice van Houten is trying to carve out a private little corner to talk on the phone. She’s on the road yet again — this time in Brussels — but despite the lack of home comforts or privacy, she’s open and engaging, as she tells Access Hollywood about her April 1 turn as Melisandre, the red priestess, in “Game of Thrones” Season 2. Already a big deal in the Netherlands, her talents have landed her roles abroad — like in Jude Law’s “Repo Men,” and opposite Tom Cruise in “Valkyrie,” but it is her upcoming journey on “Game of Thrones,” that looks to make her a household name stateside. Bewitching and mysterious, the red priestess is already the most talked about new character to join the drama, even catching the ears of those who haven’t lapped up George R.R. Martin’s “A Song of Ice and Fire” book series. With just over a week until the season premiere — and in the eighth installment in AccessHollywood.com’s “Game of Thrones” Season 2 countdown Q&A series — Carice explains just what to look out for when fans finally meet the mystical Melisandre, a woman with the ear of the late King Robert Baratheon’s brother — main player Stannis. AccessHollywood.com: So who is this red priestess, and why are we going to be so intrigued by her? Carice van Houten: Well, she’s from a foreign place, which is good for me, because that means I can stick to my accent (laughs). Basically, she’s a priestess who comes to preach her religion, her faith, and [she’s] telling everybody that there’s only one god and it’s the God of Light, the Lord of Light. In that area that they’re going to, they believe that there’s seven gods, so she’s basically a newcomer. Maybe she has a more modern look on it all, but at the same time, she’s very manipulative. She is the right hand of one of the people that could become king and she’s basically manipulating him… She’s very influential and she’s the opposite of Liam [Cunningham’s character Davos Seaworth]. Liam is the left hand. Click HERE to watch our interview with Liam! Access: What was it like the first day you saw yourself in that red wig? Carice: Oh man, loved it and I never wanted to take it off… It’s beautiful… When I take it off, it’s like ‘wah-wah-wah’ (makes a sad trumpet sound). It brings so much to the character. It’s beautiful and I really dig it. Access: Did you love it enough to try it again in your own life? Access: You did ‘Black Death’ with Sean Bean and, of course, he was in ‘Game of Thrones.’ Did the two overlap for him — and you heard things about the series? Carice: Well, I don’t know… I know this project was around, I remember I was asked to do an audition, I think in the first year it came around, and that was the year we were doing ‘Black Death.’ He probably shot it after that. Access: And then you have another coincidence — with Liam, who played your lover, Jack Hope, opposite your Ingrid Jonker, the South African poet, in ‘Black Butterflies,’ which recently came out here. Was there a ‘Game of Thrones’ connection when you were doing that movie with him? Access: He came by AccessHollwyood.com and talked about your talents and how lovely and gorgeous you are. But you get to play adversaries this time around instead of lovers. Carice: Yeah! He hates [my] guts! Access: I hear you don’t like to rehearse, but you like to talk about the work in advance? Carice: Most directors that I’ve worked with — I’ve worked with before, especially in Holland — and they know that I’m somebody who talks and asks, and talks, and talks, and talks and questions and turns things around. I’m like a little cat, walking around my little nest until I find my place. Once we shoot, then I just let all the information go and just go on intuition. Access: Liam was telling us he’s one of those guys — especially with Stephen Dillane, who plays Stannis Baratheon — where they rehearse and rehearse. Did they try to bring you into their preparations? 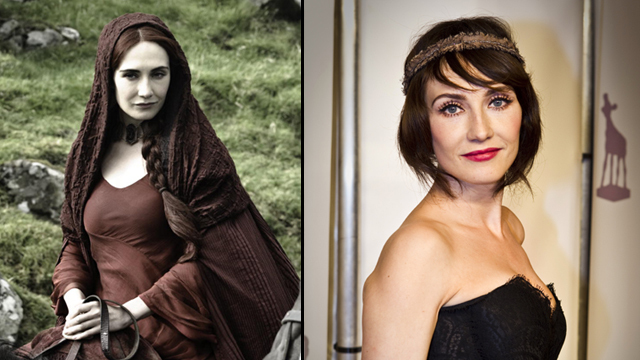 Carice: No, I think there’s just a difference between… But I’ve always had that, even when I was young, there were differences. I [would] see somebody preparing or talking to themselves or going over their lines forever, or just retreating in a little corner and… I think my preparation is before that. Access: Speaking of preparation and this character, she comes into the books and she’s fully formed… Were they able to provide you much of a background? Carice: Not much… They didn’t tell me too much because I think the writers are still searching themselves. I think, definitely, they’re working from the books, but at the same time, I think they want to have the freedom to go different directions or go slightly off trail. Access: You’re on Twitter, what’s been the reaction like so far? Carice: Oh man, I had no idea that it was so huge. I even [have] people following me now from like, Indonesia to New Zealand, to anywhere in the world really. They’re so excited, which is great, of course, but at the same time, it feels like a huge responsibility that I have, especially after Season 1… And especially because there’s a certain look about her that people have a certain idea about in their head and I might or might not live up to that. I’m not — I don’t think — the ‘babe’ per se. Do you know what I mean? Access: In the Season 2 photos – you look amazing — and — bewitching. Carice: Definitely she has those qualities, but it’s not like I look like, it’s not even in my personal life – I’m not Lara Croft kind of girl. Access: So you’ve got a movie called ‘Jackie’ coming up, with Holly Hunter. Carice: That’s a film that I shot last November/December in Albuquerque, New Mexico, and that’s a film that I’m doing with my real sister [Jelka van Houten]. We’re playing twins… raised by two gay guys and we’re looking for our biological mother in America… It’s sort of a road trip where we get to know ourselves better. It’s a bittersweet story. Access: You must be close in age if you’re playing twins. Carice: She’s two years younger than me. Access: You’ll play the older twin then. Carice: Yeah, [by] 10 minutes (laughs). “Game of Thrones” Season 2 returns to HBO on April 1 at 9 PM. “Black Butterflies” is out now in select theatres and on-demand. To read Access Hollywood’s interviews with Kit Harington (Jon Snow), Maisie Williams (Arya Stark), The Hound (Rory McCann) and more, click HERE to visit our “GOT” Season 2 countdown section.